Donofrio says her biggest source of inspiration was a little girl named Simone, a friend of the family, who was fighting MLL-R infant acute lymphoblastic leukemia at the same time. Simone was diagnosed when she was just 10.5 months old, and passed away one month after her second birthday. Julie Donofrio, her four sisters and mother are vigilant about breast cancer screenings. Like clockwork, they get mammograms each October as the nation marks Breast Cancer Awareness Month. 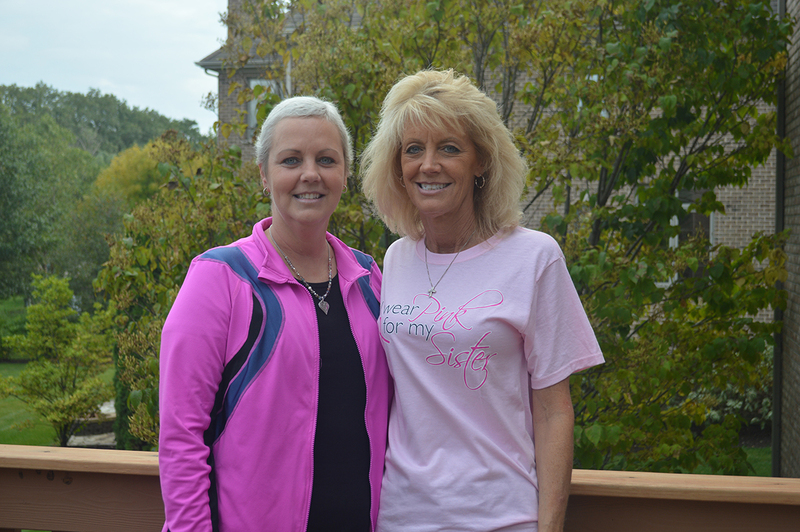 Through the yearly mammograms, Donofrio’s mother learned she had Stage 1 breast cancer five years ago, and her sister Jennifer Hensley received a diagnosis of Stage 0 breast cancer three years ago. In October 2013, Donofrio’s mammogram showed no signs of cancer, but in February 2014 the 47-year-old discovered a lump in her breast. Thinking it was a cyst, she waited until October 2014 to have another mammogram. Comprehensive testing in December revealed that she had Stage 3 breast cancer. She underwent a double mastectomy on Dec. 31, 2014, which was followed by chemotherapy and radiation. In September 2015, a tumor was discovered on one of her ovaries, and she underwent a hysterectomy. She received chemotherapy, radiation and subsequent care from Dr. Dean Conterato, radiation oncologist at Advocate Condell Medical Center in Libertyville, Ill., and Dr. Dean Tsarwhas, medical oncologist, also at Advocate Condell. Despite her medical challenges, the Vernon Hills resident has remained remarkably upbeat. She aims to spread the word about breast health and early detection. Friends and family have surrounded Donofrio throughout her fight against breast cancer. When she was diagnosed, Hensley, now a breast cancer survivor, threw a party to surround her with love and support. Nearly 40 people attended and brought thoughtful gifts such as a blanket with a photo of her and her father, who passed away earlier that year, to use during chemotherapy. Another party is already being planned for March 2016, when she completes her last treatment. As a front desk receptionist at Sedgebrook Retirement Community in Lincolnshire, Ill., she also received constant cards and encouragement from the residents and staff throughout her treatments. On Oct. 12, Donofrio and two other Advocate Health Care breast cancer survivors will be honorary captains during the Chicago Bulls’ annual Breast Cancer Awareness game. Donofrio will be joined by her sister, along with many of her friends and family. For more information about breast health, visit Stories of the Girls.